Hi friends! I'm back today to wrap up the Homework Mini-Series. Thank you so much for all of the comments and feedback during this series. I'm so excited that many of you are going to try this approach to homework this year and I can only hope that it works as well for you as it has for me! 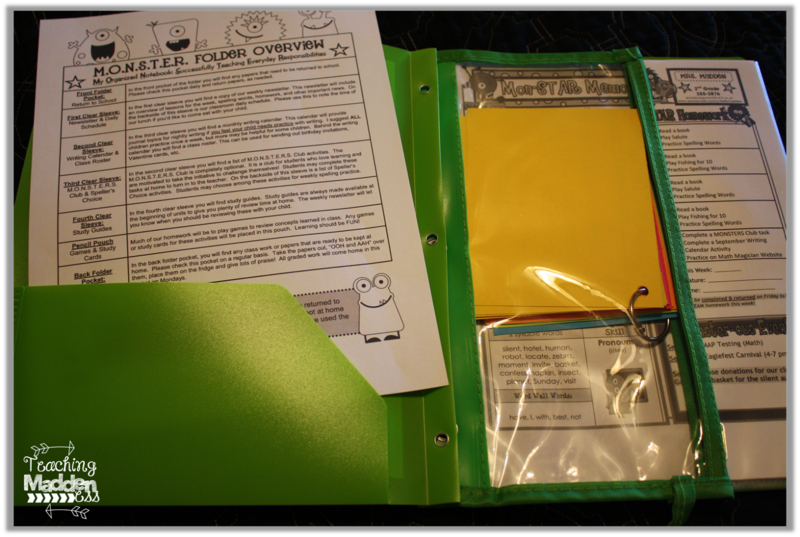 Today, I'm going to focus on my MONSTER folder (daily take-home folder) and the "extra options" that are available for homework. Right now, my classroom theme is monsters (or MonSTARS, as I like to call them) so our daily take-home folder follows right along with that theme. I have tried everything from binders to folders for my take-home organization system and I found that the two-pocket, pronged, poly-folders work the best for me! I purchase them myself at the back-to-school sales so that I can have them prepped and ready for the first day of school (and so that they all match), but you could certainly place them on your students' supply lists. I use the Avery full-page labels to print the cover and attach it to the folder. If you are looking for covers that match your theme, we have a ton of covers for every theme imaginable on our website. Just click here and select your theme to find the covers! 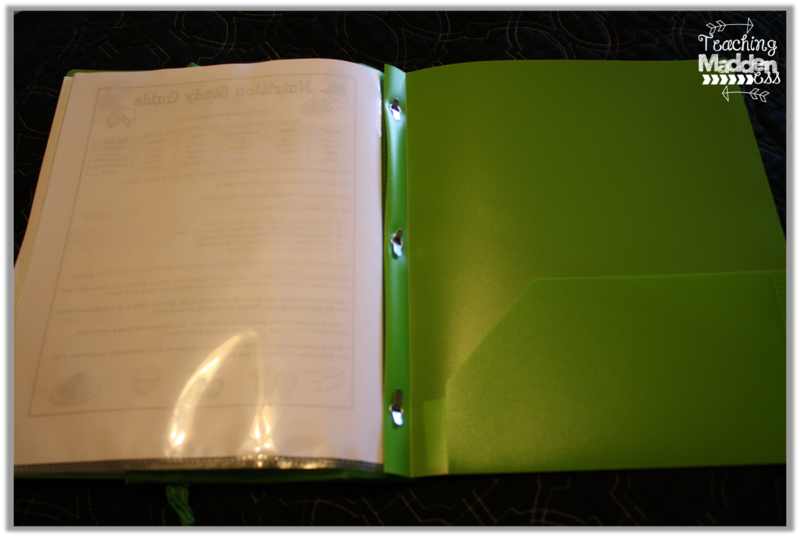 Right now, my folders are organized using one pencil pouch and four clear sleeves (page protectors). 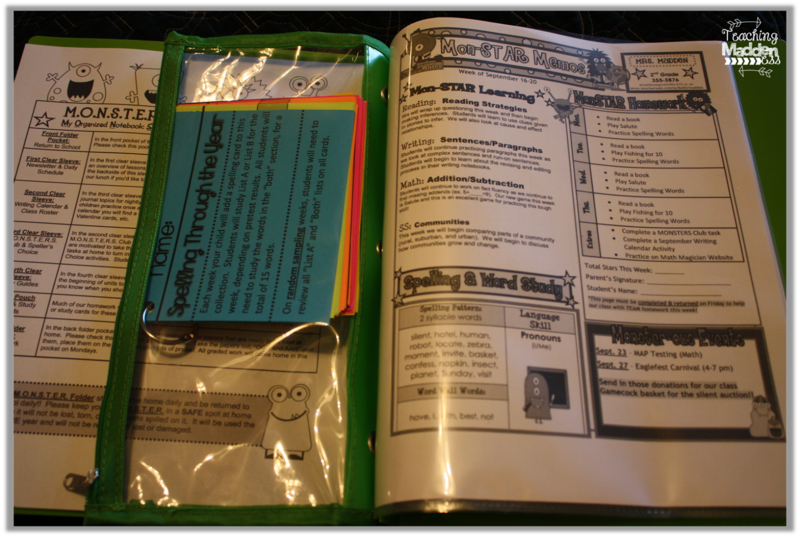 The first time the folder goes home, I stick in an "overview" page that lets parents know exactly what they will find in the folder and how it is set up to be used throughout the year. You can click HERE to download my overview page (PDF file) or HERE to download an editable file (no graphics on this one due to copyrights - artwork by KPM Doodles www.kpmdoodles.com copyright 2010). We use this front folder for important papers that will need to be returned to school. Think field trip permission forms or anything that parents will need to sign and return promptly. Placing these in this front pocket ensures (hopefully) that parents will not miss them! Then, I place a pencil pouch inside the folders. I purchase these at The Dollar Tree usually and the great thing is that they can usually be used for a few years at least! This is the pouch where their math game cards, other games, or study cards are placed. This ensures that students have them at school and also at home or daycare - wherever they go! If you flip the pouch over, you'll see our weekly newsletter. We are required to publish a newsletter weekly, so this is the perfect place for me to list homework of the week. If you don't publish a weekly newsletter, you could send home Homework Bookmarks with the weekly options listed. 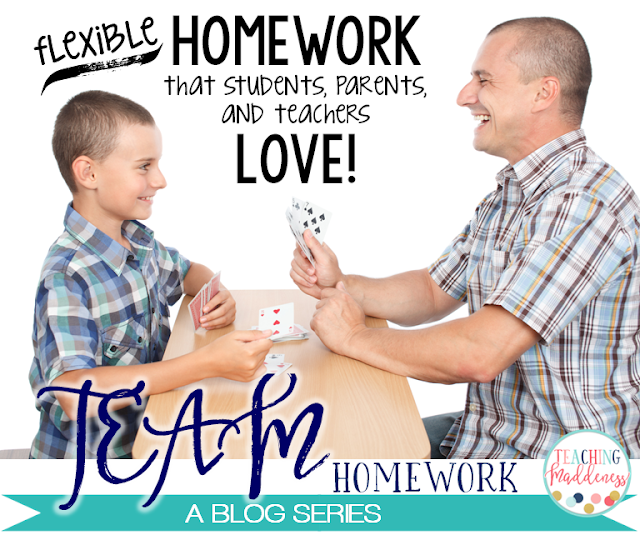 A template for those (as well as a parent letter explaining the TEAM Homework approach) is included in our Dealing With Math Homework Card Games (See Post 2 for more information on that). *Update: After many requests I created an editable version of my newsletter that can be found HERE. *Update 2: My set of 22 seasonal and holiday Clean & Modern Editable Newsletter templates may also be used for TEAM homework. On Mondays, students will enter the room to find their new newsletters on their desks. It takes a couple of weeks, but they quickly become pros at removing and inserting papers into the sleeves in their folders. I do not do this for them. I also include a class roster for parents. Again, this just saves them from emailing me to ask for a class list when they want to send birthday invitations or make Valentine's cards, etc. 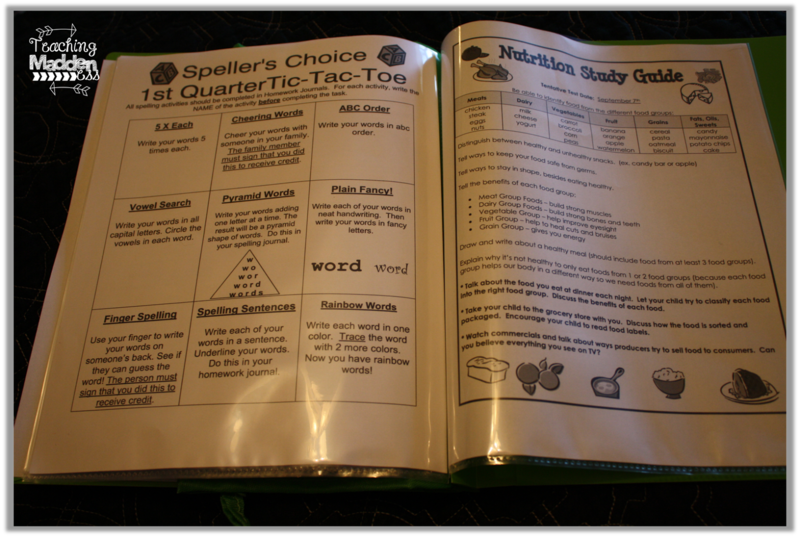 Next, I have some type of Spelling Menu or Choice page (I'm working on a new one of these that will be included in my Differentiated Spelling Unit). Students may use this page to get ideas for practicing their spelling words in new and different ways. Finally, I have our unit study guides. I only provide study guides for our science/social studies units, but I always place the study guides in this sleeve on the very first day of the unit. I do this for several reasons 1) so I don't forget (ha! But seriously, that is one of the top reasons) 2) So parents have ample time to help their students prepare for the tests 3) I love that students can use it to preview/review. I know typically study guides are a review, but I love that by providing it at the beginning of the unit, some students will begin "previewing" it right away and by the time we get to certain topics they are able to help teach it. They are so proud! Often times I'll list the "review study guide" as an "extra option" on our homework up until the final week before our test. Then, I'll move it to one of the nightly suggested options. If, for some reason, I have an additional study guide there is space left for that, too. The back pocket of our folders is used for classroom work and/or graded work that is ready to be taken home and kept at home - no need to return these papers to school. Besides the "MONSTERS Club" and study guides, I will sometimes add other options to the extras, like practice lowercase cursive letters (after we've practiced those in class) or visit (a certain website) to practice (a skill we're focusing on). The great thing about this approach is that you can add or delete things as you wish to make it meet the needs of your students at any particular moment. That's it, friends! That's a wrap on homework! If you decide to use this approach I would love for you to let me know how it works for you this year! Enjoy the last days/weeks of summer! UPDATE: After many requests, I've created a BUNDLE of all of my homework options. You can also find the individual resources linked here. Post 5: That's a Wrap! I LOVE how organized you are! I am sure your parents are so happy with how you've organized this folder. As a parent, I'd love it! Wow. Just wow. This series has me recontimplating my whole approach to homework. I'd better decide fast because school starts in just 2 weeks! Thanks for your helpful tips on Homework. I was just curious ...I went to your shop to locate your Monster Folder Cover you have on this post...however there is a different one. Where might I find this one? Hi Debbie! I'll get this one up in the shop this week! thanks for the has glimpse into how you manage homework, even though I've learned so much more! I appreciate that you share what works in your class. Such great ideas! Again, thanks so much for the help, tips and advice! My students' take home folders look very similar to yours. I love the idea of having the students put the new newsletter in their folders. I usually do this, but it takes awhile. 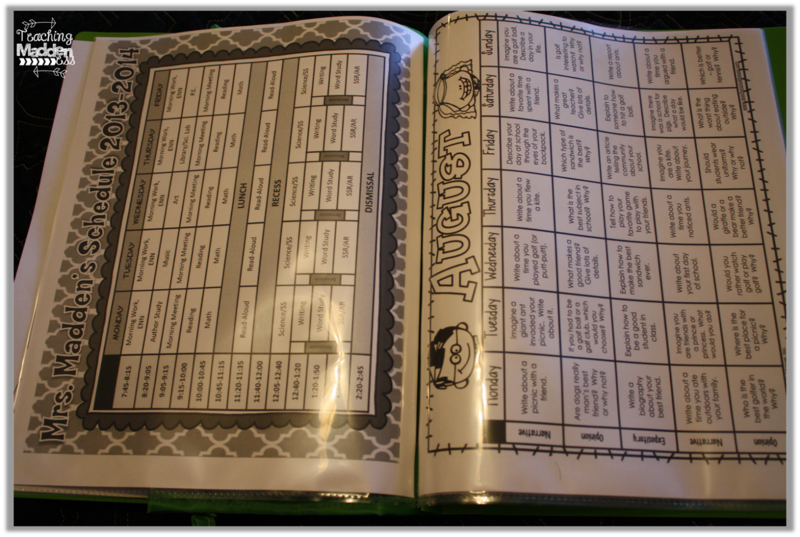 I also love the idea of putting a daily schedule and class roster in the folder. These are pages that will be added to mine this year. Thanks for all the great tips. I love the Mastery Club. It will be great for my second graders. Do you have it in an owl theme? I could not find it on TpT. Hi Jacqui! I do not have the club page for sale. I saw the idea online and created my own version for my classroom. I would suggest using your standards and student interests to create one specifically for your room. Thank you for the great HW ideas. Now if I can just get my teaching partner to buy into the Take Home Folders. I'm not sure which files you're looking for. I've added the MONSTER Overview to this post as a free download. The MONSTERS Club is not for sale. Most other items can be found in our shop - Teacher's Clubhouse. 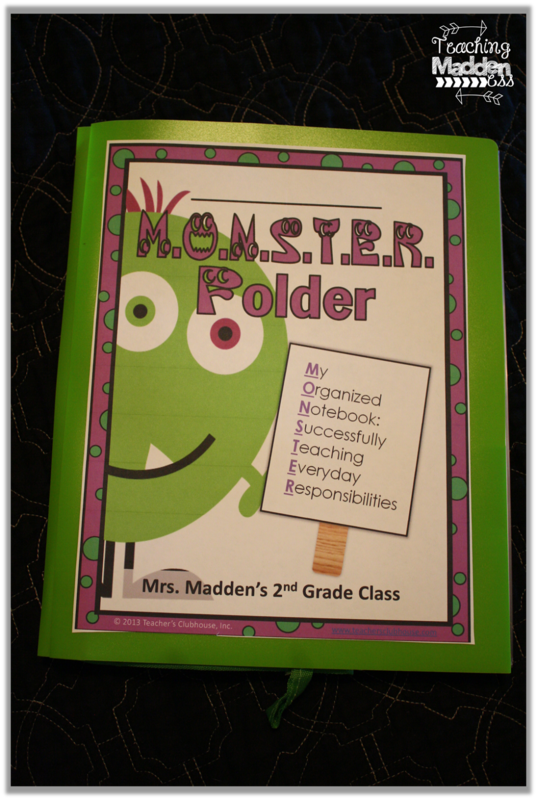 Are your files available to purchase, I am curious about your initial letter explaining your homework to the parents, and what topics you include in your monster club. The MONSTERS club is not for sale. I found that idea online and created one for use in my classroom. I used my standards and student interests to create the tasks. I included my TEAM homework parent letter in the Dealing with Math Homework resource available at Teacher's Clubhouse. Wow - so wonderfully organized! Love the ideas and can certainly use many in middle school! Hey, there, Amanda! I found your Monster themed products on Teacher's Clubhouse, but I'm wondering if you've made available the examples you show here in your blog post. I love how adorable they are! Hi Amy! I'll get this cover uploaded in the shop this week! I added the Monster folder overview to this post as a freebie! Hi Amanda! You are an amazing teacher and I enjoy reading all of your info on your website.Question...Do you sell your folder information sheet such as the folder overview, MONSTER Club, and your study guides? I couldn't find it on Teacher's Clubhouse. Thanks Dee! <3 I've uploaded the folder overview to this blog post as a freebie! The MONSTER Club is not for sale. I found that idea online and adapted it for my classroom. I used my standards and student interests to create the tasks. Most of the study guides I use are included within our units at Teacher's Clubhouse. I love your ideas. Are you going to make these pages available to buy or as freebies? I would really like to implement the take home folders this year and we start school in less than two weeks. Thank you so much! Thanks Daphne! I've uploaded the folder overview to this blog post as a freebie! The MONSTER Club is not for sale. I found that idea online and adapted it for my classroom. I used my standards and student interests to create the tasks. Most everything else can be found in our shop - Teacher's Clubhouse. I am always impressed with the quality of resources you use and create in your classroom. 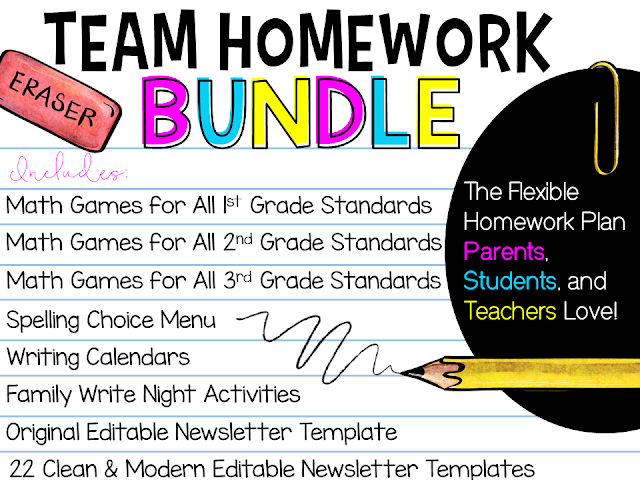 I would love to purchase some of these homework products. Thanks so much! You can find the homework products in our shop, Teacher's Clubhouse. I wish I would have read this two weeks ago!!! This is so fantastic Amanda!! This is exactly what I want to do. Looks like I have some organizing to do and a few purchases to make. Thank you so much for these great posts!! I LOVE this! 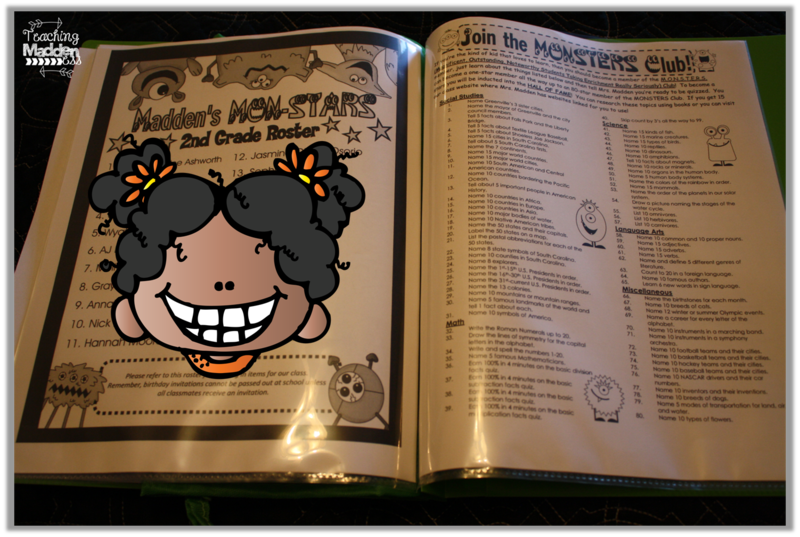 I am especially intrigued by your MONSTARS club and how you organize/keep track of the stars your students receive. I will definitely be adapting for my scholars. This whole series has been incredibly helpful and inspiring. Thank you so much! Thanks so much for these great ideas and resources. I read all of the pieces, but haven't yet finished watching the Whole Brain Teaching video....it's so long! You mentioned that the kids turn in their paper on Friday...is that all you do to check? Do you total them that day, do you keep track throughout the week? Do you ever see the writing they do at home? I am thinking through implementing something similar in my room this year. Do you mind sharing where you originally found the idea for the MONSTERS Club? I can't wait to create my own.